"These flats are ready for dumping, boss!!!" 0-47-19 tidied up and ready to go. This is the Moore Rambler 0-47-19, a typical Wichurana Rambler in most every way. I keep several plants of it on the farm, because you never know when a Gopher or other force of nature might decide to destroy a plant. Backups are as meaningful in an archive of plants as they are with your hard drive! Twas a pleasant afternoon yesterday and so I spent a pleasant hour in greenhouse 3 tidying up this 0-47-19, getting the canes all wound together into orderly fashion, so they'd be accessible for pollination in May. Downy Mildew. If you have ever had to deal with it in your greenhouse (or worse, your garden) you will be clenching your teeth in dread right now. If you are not familiar with it, count your blessings. It would be wise to do a bit of reading, though, just so you know what you are dealing with should you ever have it happen to you. Thanks to the Marin Rose Society for publishing this resource. Un-named Gallica seedling, circa 1999. This has been sitting in my archive of seedlings from over a decade ago, loved but not shared. Every once in a while I look at it long and hard and think "This thing is so beautiful....but totally redundant; an anachronism." 'Penny Ante' presents nicely shaped HT style miniature blooms in a rich yellow tinted with red. Blooms open very fast and do fade, but otherwise are quite pretty for the type. The plant is very upright and stiff and rather lacking in balance of architecture, in my opinion, a characteristic it tends to pass on a bit too easily. Still, it has turned out to be a very useful breeding plant and has some very useful traits: it blooms in truly massive clusters, up to 40 blooms on a spike, which it often passes on to offspring. 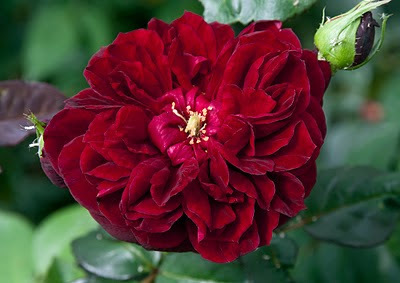 It also has excellent vigor and reblooms much better than its English parent. 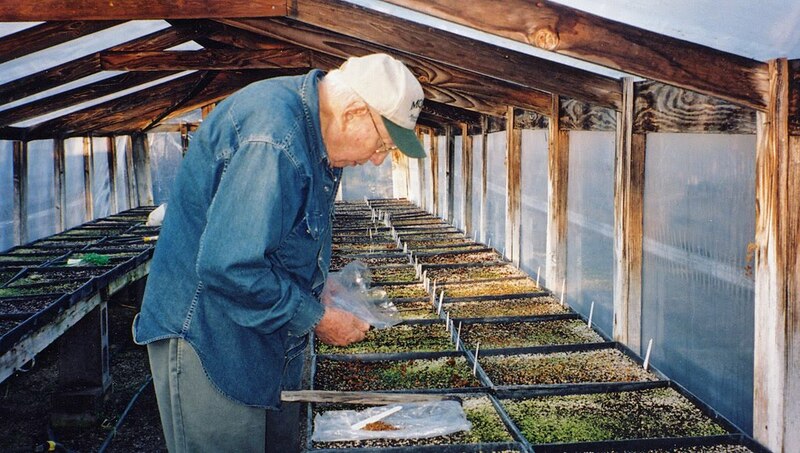 Ralph Moore often told me he thought the miniatures had the ability to pass on some valuable properties to future generations, including abundance/frequency of bloom. I can see now just how right he was. 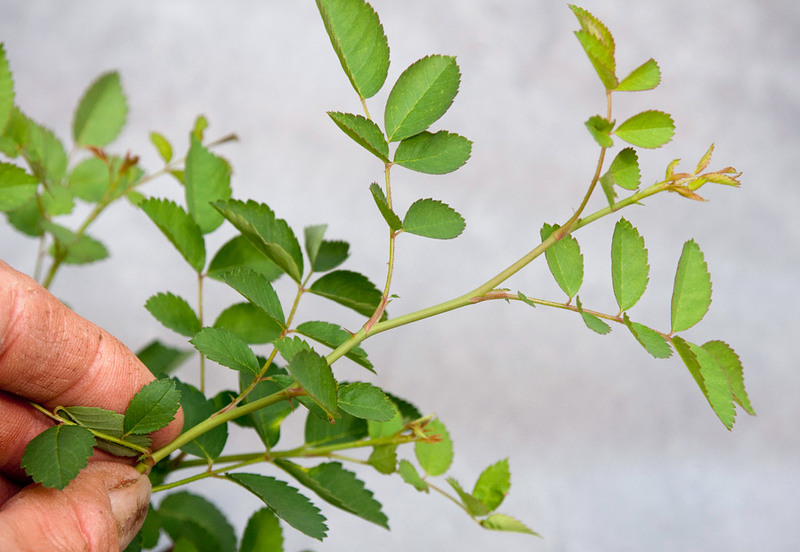 Although it doesn't have stellar disease resistance, "Penny-Trad" has a track record of breeding some highly disease-free seedlings, when mated with the right thing. You just never know where your best breeders are going to come from. 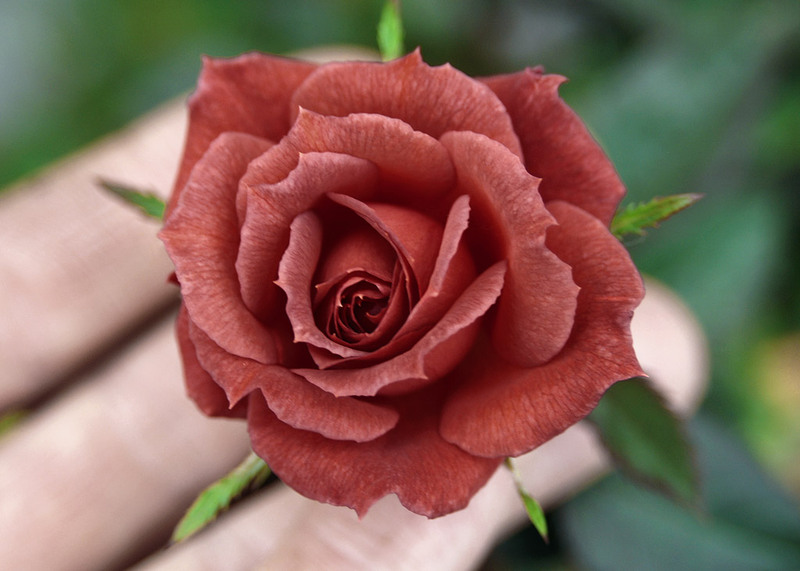 81-02-01: 'Oakington Ruby' X 'Little Chief', 2002. Nicknamed "Priscilla Plumbbob". It is undeniable that Ralph Moore's work heavily influenced my own vision of rose breeding in the early 2000s. At times I even sought to mirror some of his own efforts, if for no other reason than to simply see first hand what kind of variations could be had with such crosses. It is worth remembering that when a hybridizer releases a selection into commerce, that we, the consumers, are seeing only one plant the breeder considered to be the best of the lot. The rest of the seedlings tell a much bigger story: perhaps the selected one was the only seedling of merit in a sea of junk. Or perhaps there were dozens of runners up that were so, so close to ideal that many were considered for commerce. Or maybe germination was terrible and there were only five seedlings to evaluate at all! You never know. I've seen all of these scenarios in my own work. This cute little pink number is one of my favorites of the lot, but has not been introduced into commerce, as I regard it as a bit of an anachronism and hardly something a lot of people are going to be interested in. It is 8 years old now and still happily occupies a 5 gallon pot, and has not exceeded 15" tall and about as wide. 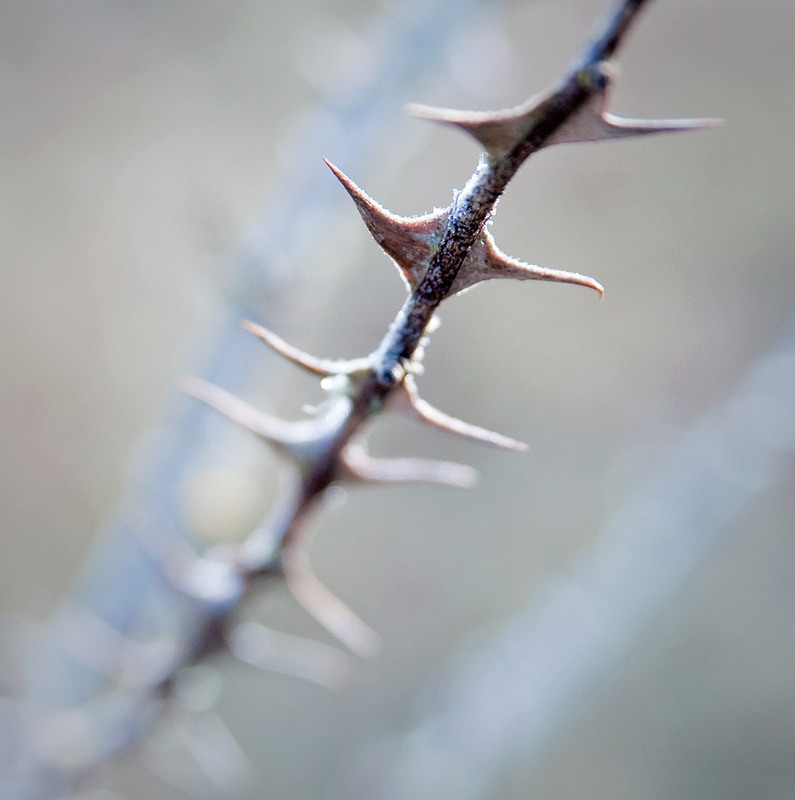 It is intermediate in style between the two parents and fairly thorny. I presents its bloom in clusters spread attractively across its canopy of dense, bright green growth and is in bloom on and off all season. 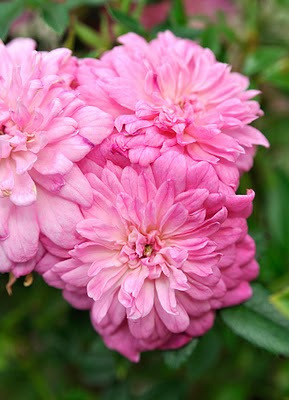 The candy pink blooms are about an inch across, very double and have an unusual sweet candy-like fragrance, similar to the scent of certain China cultivars. It sets seed on occasion, although I have never tried to germinate them. Maybe I will sow a few this year, just out of curiosity. The seed parent I used is one I am using more often as time goes by; a self seedling of Ralph Moore's Wichurana Rambler 0-47-19. (0-47-19 is a cross between R. wichurana and 'Floradora') My seedling 42-03-02 has been described in my blog before, but briefly, it is a dwarf-ish shrub to about 3 X 3 feet, with glossy small foliage and a constant supply of one inch deep pink to purple blooms in clusters of up to 30. It is extremely healthy and sets seed readily. It also happens to be a diploid. In this case, the pollen parent I used is a particularly dark selection of R. pisocarpa that is growing near my home. At least 20 seedlings were selected from this cross in Summer 2010 and now reside in gallon cans. These were all extremely vigorous and quite healthy, but as expected, they have not flowered yet.....except the one shown here. This seedling, #14 began flowering sparingly in July, and bloomed twice more before cold weather shut it down for the year. 'Peach Candy', bred by Moore, introduced by Sequoia Nursery in 1995. Parentage: 'Sheri Anne' X 'Topaz Jewel'. Ralph Moore did considerable work in the past 20 years with various Rugosa hybrids. 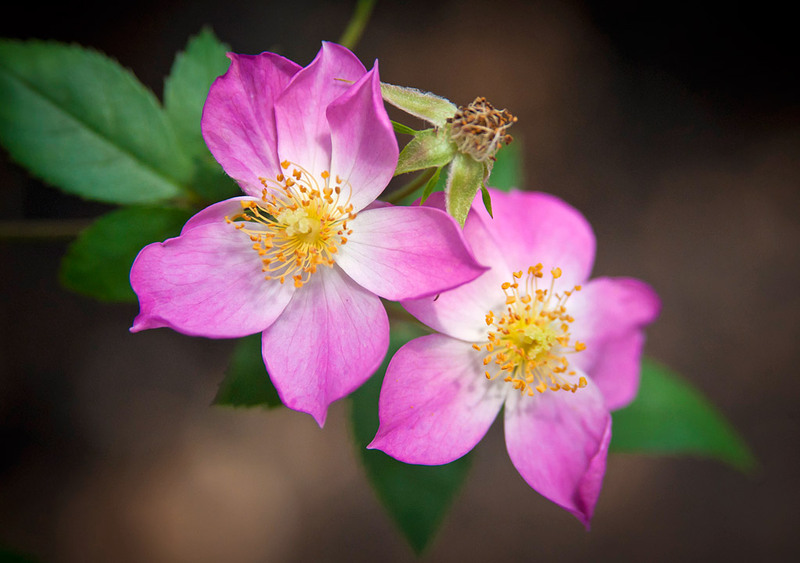 There wasn't a breeding line at Sequoia Nursery that didn't get some Rugosa genes injected into it at some stage. The results, of course, varied wildly; some were spectacularly unique, some were monsters with a renegade persona, some were tragic mutants that signaled a mismatch of genetics from widely divergent branches of the family tree. My recollection when discussing these breeding lines with Ralph is that many seedlings were troubled in some way and very, very few were noteworthy. One of the most successful of the Hybrid Rugosas Ralph bred was 'Topaz Jewel', a stunning soft medium yellow hybrid from a cross of 'Golden Angel' X 'Belle Poitvine'. Many breeders, Ralph included, have sought to take 'Topaz Jewel' a step further in the hopes of generating a true yellow Rugosa hybrid that has the toughness of the Rugosas and the generous rebloom of more modern hybrids. Unfortunately that hasn't been easy. I know that some people continue to try to work with it, and in spite of the fact that it apparently is a diploid, (no aneuploidy as far as we know) it almost never sets any seed and its pollen rarely, if ever, results in seed set on other hybrids. Ralph himself produced but one hybrids from 'Topaz Jewel', the lovely 'Peach Candy' pictured here. It has none of the characteristics of its Rugosa pedigree (unless you count its reluctance to propagate from cuttings), looking like a rather ordinary peachy-hued Miniature. Some goals, no matter how persistent the breeder, just aren't going to get you where you hoped to go. Still, it doesn't hurt to try. 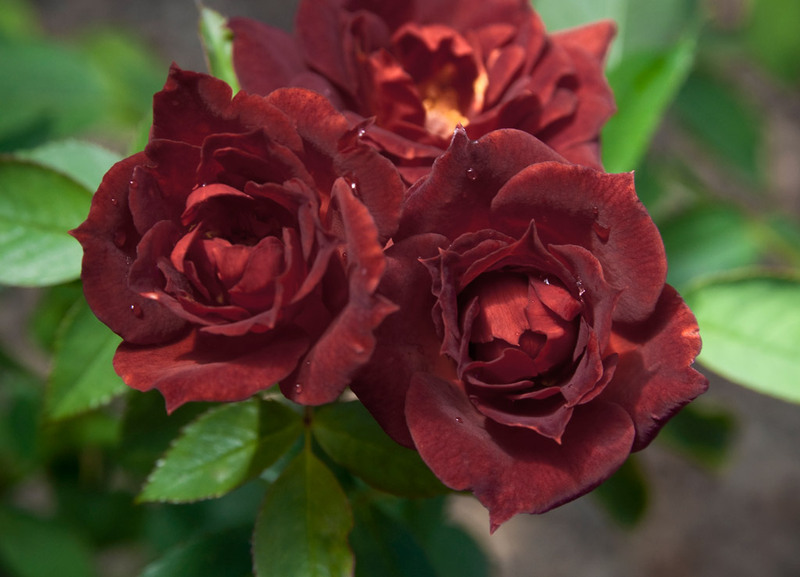 Breeding: 1-72-1 (Moore, 1972, sister seedling to 'Rise 'N' Shine') X 'Hot Cocoa'. The seedling at top is 58-06-05, the lower photo is of its sister, 58-06-07. There were other selections from this cross back in '07, but they were discarded for various reasons. (I seem to recall the others were rather ordinary oranges and soft yellows; nothing remarkable) These two were kept for their remarkable coloring, the first one being the most dramatic of the two, as you can see. It is very difficult to capture the color of either with a camera, but these photos come close to being accurate. If you are familiar with the old Floribunda 'Jocelyn', or Sam McGredy's 'Brown Velvet', then you have some idea how these two look. 58-06-07 (the second one) has very shapely flowers very reminiscent of its seed parent. 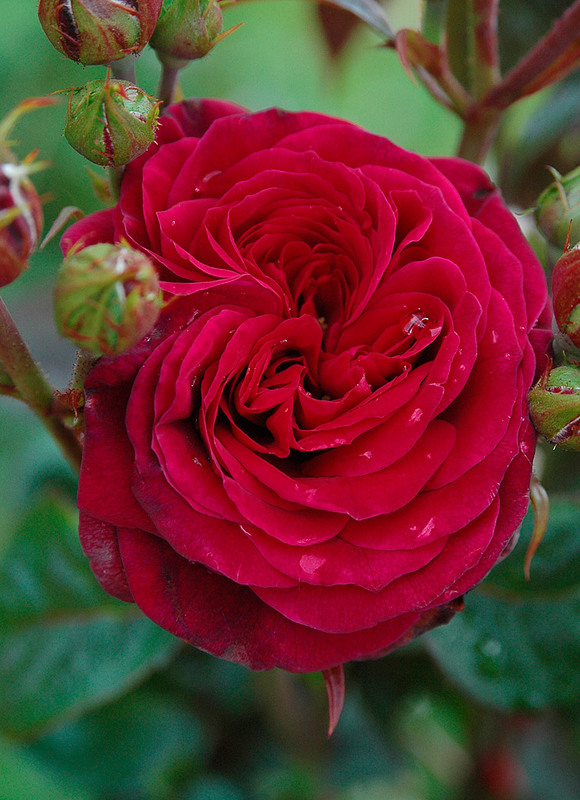 1-72-1 often breeds bloom form like this, which is why Moore liked working with it so much. (That and the fact that it often breeds good, strong colors) I'm not sure about the future of 58-06-07 though, since it doesn't produce quite enough volume of bloom, tending to produce one or two blooms at the end of a shoot. That ain't a trait I like to see in my work, so I may try it as a breeder and just leave it on the bench for a while. The other one, the richly colored 58-06-05, is a much more generous bloomer, producing most of its bloom in clusters of three or more, and quite a lot of them too. Like its sister, it is a tallish, upright grower, although it is well branched, eventually forming a pillar-shaped bush to about 4 or 5 feet tall. No doubt it could be trained into a bushier form, if you wanted to. 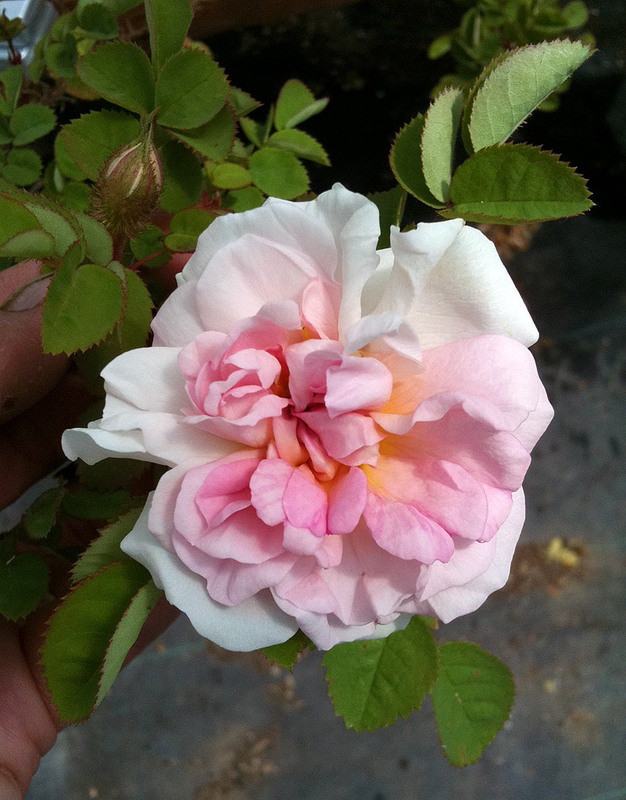 This year, I have decided to submit this variety to Rogue Valley Roses to auction off the naming rights. If it works out, I will likely select a new seedling every year to auction off. Rogue Valley doesn't yet have any information on their site to announce the details of this offer, but I expect it will be coming quite soon. I'll let you know more about it when it happens. I found a Sequoia Nursery catalog from 1959, the year I was born, featuring many of the best of the Moore roses to that point. Available here as a PDF file. Enjoy! Another memento from the Ralph Moore archive, on his 104th birthday: a flyer advertising the introduction of 'Bit 'O' Sunshine', probably mailed out in 1956, the year of its introduction. 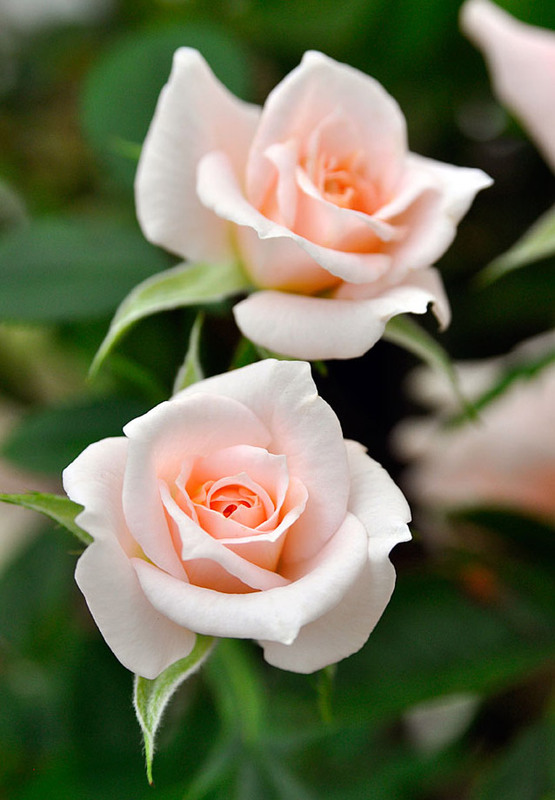 Interesting story about 'Bit 'O' Sunshine': back in the early 2000's, Carolyn Supinger, Sequoia's general manager sent me a list of Ralph's roses that she was trying to find plants of, so Sequoia could "bring home" as many of the Moore roses as were still around. Of course, many of the pre-1960 varieties remain lost and in all likelihood are extinct now. 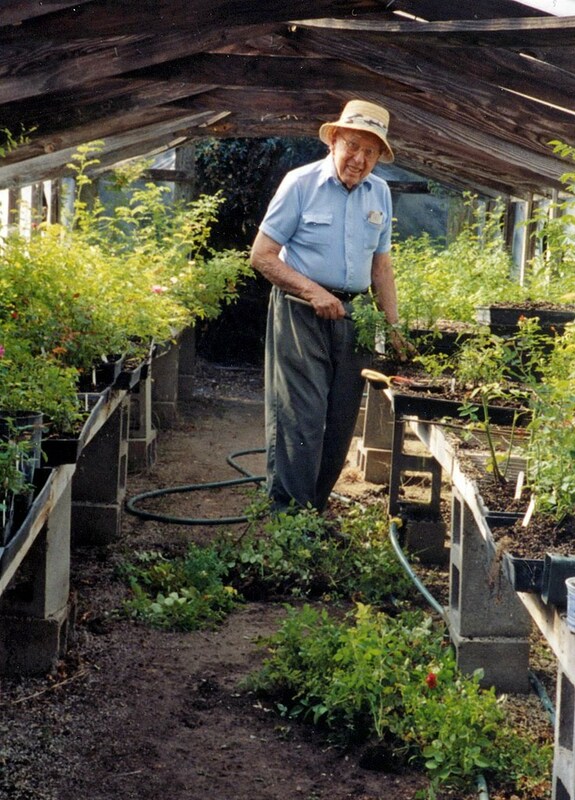 However, many "lost" cultivars did find their way back to Sequoia Nursery. Shortly after Jerry Justice died, I was visiting with his nursery manager, Santos, who was sorting the inventory and dispatching it as responsibly as she could. I was sorting through a tray of 'Rise 'N' Shine's I was buying and in the tray was a half dozen plants that were clearly not 'Rise 'N' Shine'. I pointed this out to Santos who didn't know what they were. So, I took them home with me, knowing that Carolyn was looking for some of Ralph's older roses. Who knows, right? I sent three plants to Carolyn at Sequoia, and she gave them to Ralph for identification. Well, guess what? Ralph said they were 'Bit 'O' Sunshine', one of his varieties from the mid-fifties. One other "lost" variety was found growing at Justice Miniatures that year as well: 'Strawberry Swirl', one of the early Mini Mosses Moore bred. 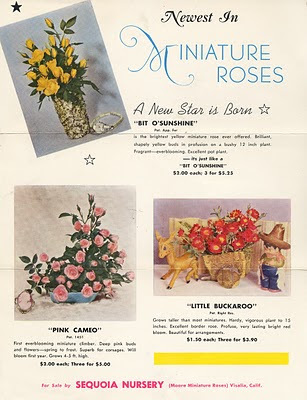 As it happens, I have living specimens of all three of the roses listed in this flyer! Today would have been Ralph Moore's 104th birthday. 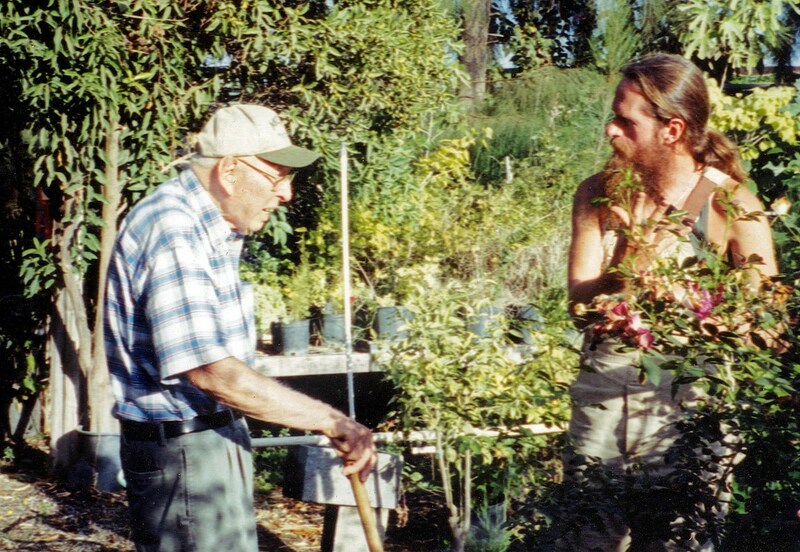 This is to say thanks, Ralph, for all of the knowledge you have shared with many of us, and a personal thank you for sharing with me a number of your most valued breeding plants. They are getting a workout here, I assure you! 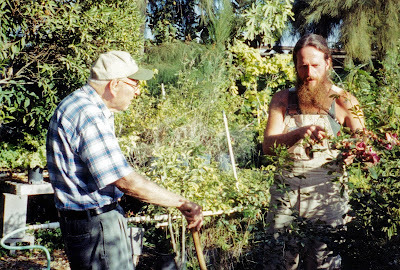 I believe the photos shown here are all by Carolyn Supinger, Moore's general manager for many years at Sequoia Nursery. 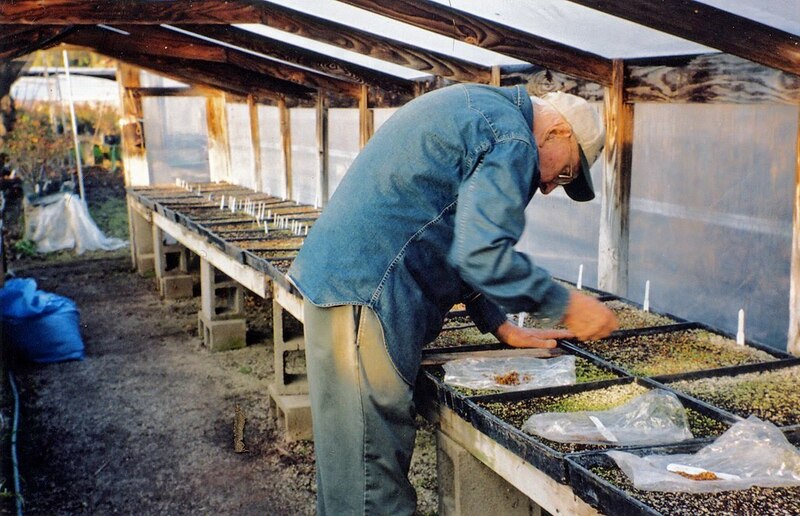 It would be at about this time of the year that Ralph would have been sowing the previous year's seed crop, as he is doing in the upper two images. In the third image it is late Spring and Ralph is weeding out unwanted seedlings to make room for the better ones. 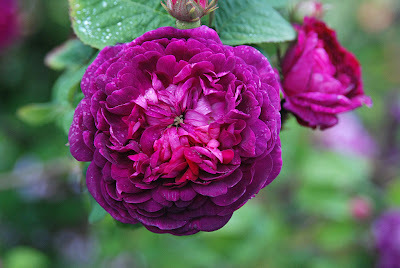 In the last two images, Ralph and I are talking about thornlessness in roses. If I am not mistaken, the plant I am looking at ended up being named 'Gina's Rose', one of the thornless shrubs bred from 'Basye's Legacy'. Thank you Ralph, for all the glorious roses, and for showing the rest of us how to approach rose breeding with creative abandon. I finally located a photo of an open bloom of 72-08-11 (Condoleezza X William III), mentioned last Spring in a blog post. Not much of a photo (low res from my iPhone) but you get the idea. This reminds me of 'Great Maiden's Blush' in color and form, and it has a decent fragrance as well. See the spiky mossing on the bud in the upper left? I plan on working a few of this group of 72-08s into breeding this coming spring, assuming any of them have fertility. Who knows, maybe the Spinisissima genes will be a new resource for winter hardiness and disease resistance. 121-06-14 = 174-02-17 (Sheri Anne X Out of Yesteryear) X Tradescant. Once again, I am indoors by the wood stove on a cold and foggy morning, sorting through my photo archives as part of a dual effort: catalog the photos, and locate pics appropriate to use in the new database I am building to document my breeding program. The seedling pictured here is currently under evaluation for its garden-worthiness, and it has great potential so far. Speaking of databases, any of you hybridizers working with plants of any kind, looking for a great way to document your breeding plants and seedlings, I would like to recommend Tap Forms for the iOS platform. (iOS is the operating system that runs the Apple devices: iPhones, iPad, etc) Tap Forms has turned out to be the ideal tool for documenting in great detail every seedling I am using, and includes a way to include full sized photos, Web URLs for external reference, and all the stuff you'd expect to want to record, like growth habit, fertility, parentage, etc. etc. It also provides multiple ways to back up data, including an easy-as-pie sync to DropBox, where you can export the database as a CSV file. There is a free "lite" version available for the iPhone if you want to try before you buy. Check out Tap Forms in the iTunes App Store. Winter beauty in the rose garden. I cannot be said that the garden....any garden, has nothing to offer in the Winter months. Roses, with their thorns and architecture, and even the occasional withered bloom or bud, are often a visual treat on a frosty morning. Pictured here is a seed grown plant of R. sericea ptericantha, the Wingthorn Rose. Happy New Year to all, and may 2011 be kind to you and your gardens.